This is a new method for performing the "Any Card at Any Number" (ACAAN) Prediction. The magician shows, one by one, that all the cards are different. The magician shuffles the deck, and then allows the spectator to cut it at any point. The magician shows that he has a prediction inside his wallet, which shall be revealed later. The spectator then names any number from 1-52. 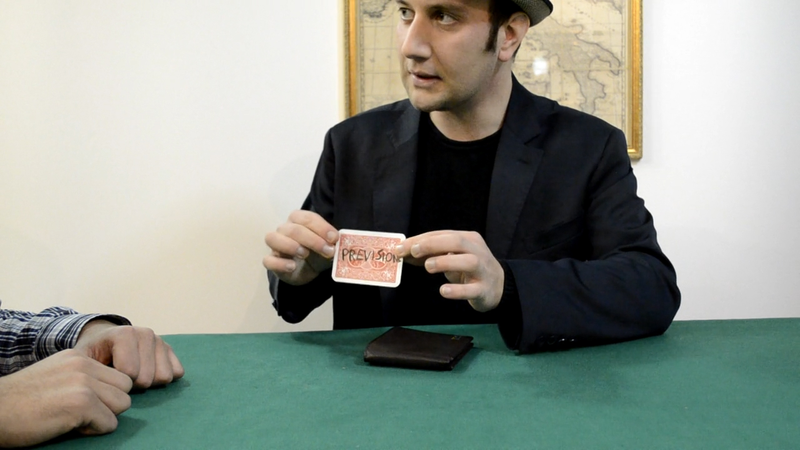 The magician counts to that number and shows the spectator the card that appears at that precise number. He then removes his wallet, opens it, and points to the one card that is inside the wallet. It says "Prediction" on its back. When turned face up, it is found to be the spectator's selected card! This method doesn't use glue, a special fluid, a magnet, adhesive paper, thread, a special pocket wallet, or a force. The spectator can even drop the card at the chosen number on the table. This and other effects are explained in detail so you can perform this new presentation. Download the online video and enjoy performing Devil's Deck!